Dartmouth Dam captures the high quality alpine water flowing down the Mitta Mitta River and from its tributaries. Located about 25 km upstream of the township of Mitta Mitta in north-eastern Victoria, the reservoir is the most upstream storage and is the largest capacity storage in the River Murray system. It has the highest embankment of any dam in Australia. The Governor General, the R. Hon. Sir Paul Hasluck, officially opened work on the Dartmouth Dam project on 15 February 1973. Construction was completed in 1979 by the State Rivers and Water Supply Commission on behalf of the River Murray Commission. When full, the dam holds more than 40% of the River Murray system's total storage capacity. The reservoir stores 3,856 GL of water at capacity. At times, it supplements releases from the downstream Hume Dam and increases supplies to the River Murray system, which is particularly important in dry seasons. Aerial view of Dartmouth Dam. Photo by Michael Bell. The catchment is located entirely within Victoria and has an area of approximately 3,600 km² — less than a quarter of the catchment of Hume Reservoir and only about 0.3% of the Basin. Despite the catchment's size, almost 10% of the inflow to the River Murray System comes from upstream of Dartmouth Dam. Dartmouth's storage capacity is relatively large for its catchment area with a total volume more than 4 times the average annual inflow volume. Downstream of the dam the Mitta Mitta River has a relatively small channel capacity. The water level in Dartmouth Reservoir varies more slowly compared with some other storages on the Murray and its tributaries as a result of these characteristics. Even during relatively wet periods, the storage can take several years to fill after being drawn down to low levels. The dam wall consists of a large earth and rock-fill embankment which is 180 m high from the lowest part of the foundation to the roadway across the top of the dam. 2.8 million cubic metres of earth for the core. The embankment is 670 m long at the top and 700 m wide at its base. The spillway is now located on the site where the rock used for the construction of the dam wall was quarried. The spillway's crest is 486 m above sea level and is about 92 m long. On rare occasions when the reservoir exceeds its capacity, floodwater flows over the crest and down an 80 m long concrete chute. The water then returns to the river via a rock cascade which gradually widens to be 300 m across at river level. The spillway is subject to erosion and has been built to spread flood waters evenly across the face of the cascading steps. When the spillway was designed it was acknowledged that it might eventually need to be concrete lined. It was decided, on economic grounds, that concrete lining should be deferred for as long as possible. 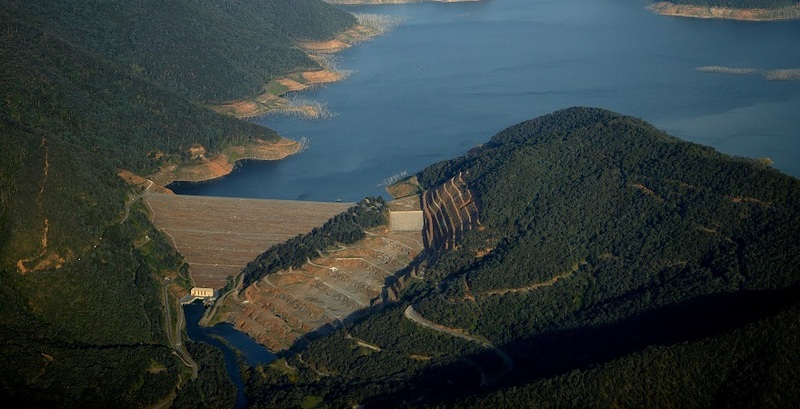 Once Dartmouth Reservoir reaches 99% capacity, it is considered to be 'operationally full'. Water is then passed through the outlet works and power station whenever possible to prevent the level rising further. Water will only flow over the spillway if significant floodwater enters from upstream when the storage is close to full. This approach reduces the chance of downstream flooding, maximises hydro-power generation and protects the spillway from damage. Water can be released through either the high level or low level outlet towers. The high level tower is located on the left abutment and provides access to the top 75% of storage capacity. The high level outlet works are connected to a 180 MW power station located at the base of the dam. the high level outlet is undergoing maintenance. When the water level reaches the minimum operating level of the low level outlet works (365 m above sea level), 71 GL of water remains in the reservoir. This is referred to as 'dead storage'. The Dartmouth power station commenced operation in January 1981 and consists of a single 180 MW hydro-generator. The power station is remotely operated by AGL Hydro and is strictly controlled to give precedence to downstream water requirements. Whenever possible, releases for irrigation are made through the power station. The power station is located at the base of the dam wall and its maximum permissible flow is 12,000 ML/day. It can operate unrestricted when water level is between 434 and 483.5 m above sea level. Strict guidelines apply when it operates outside this range. If the storage falls below 432 m above sea level (or 32% capacity), the power station is turned off. A small regulating lake known as Banimboola Pondage was constructed about nine kilometres downstream of Dartmouth Dam. It is used to regulate releases from the dam into the river downstream. The pondage wall is concrete and incorporates 3 sets of regulating gates and 3 penstocks that deliver water to a spillway. It has a hydroelectric power station, which at 12.5 MW is considerably smaller than the main Dartmouth power station. Both the regulating pondage and the power station are operated remotely from the AGL Hydro Control Centre in Mount Beauty. Read the flood management plan for downstream floodplain communities.